Is your remote support GDPR compliant? 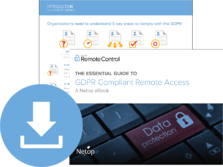 Download "The Essential Guide to GDPR Compliant Remote Access"
The GDPR, or the General Data Protection Regulation, governs the way that personal data of EU citizens is processed, moved, and stored. The regulation goes into effect on May 25th, 2018, and many businesses are scrambling to avoid non-compliance penalties. What exactly is the scope of the GDPR? Does the GDPR affect my business? What are the 5 Keys to GDPR Compliance? What are the penalties if I do not comply?